Boxing fans have been treated to a number of memorable fights in the first quarter of 2018 and Saturday's heavyweight unification match between British boxing superstar Anthony Joshua (20-0, 20 KOs) and New Zealand's Joseph Parker (24-0, 18 KOs) should continue the sport's winning streak. Over 75,000 fans are expected to fill Principality Stadium in Cardiff, Wales. As a champion Joshua has been riding the wave to true superstardom. Last year he knocked out Wladimir Klitschko in almost everyone's fight of the year and he also dispatched the capable Carlos Takam in 10 rounds. Joshua features power in both hands and a strong boxing foundation. He did hit the deck against Klitschko and his chin is not his strongest attribute in the ring. Although there's been a lot of excitement in boxing circles about a possible mega-fight between Joshua and American titlist Deontay Wilder, Parker will look to rewrite the existing narrative in the heavyweight division; this is his moment to shine. However, in his last fight, he was lucky to escape with a majority decision over Hughie Fury. There's no use in sugar-coating it: Parker-Fury was atrocious to watch. Fury had a lot of success back-footing Parker, who often crudely lunged in with ineffective power shots. Nevertheless, two judges preferred Parker's attempts at aggression and he was awarded the decision. Luckily for Parker, Joshua won't employ the same type of evasive style that Fury displayed. Joshua prefers to fight in the pocket. He likes to mix in his power shots and he'll look to land his best punch, his right uppercut; however, he needs to be in range for that to happen. Thus, Parker should have opportunities to land and trade. But does Parker have enough dimensions in the ring to beat Joshua or will he be outgunned by a more versatile opponent? Will Joshua continue his assault on the heavyweight division? Below are the Keys to the Fight. My prediction will be at the end of the article. 1. Will Joshua box or fight? Part of what makes Joshua so refreshing is that he's a heavyweight who doesn't shy away from contact. Unlike the Klitschko brothers, Joshua doesn't believe in neutralizing opponents. He wants to assert himself in the ring and dominate his opposition. He's not afraid to take a shot to land one. However, Joshua's not a brawler by any means. With a solid jab, a large arsenal of punches and athleticism, Joshua can also win rounds via fundamental boxing. Against Parker, Joshua will have significant size and reach advantages. He can control the outside and use his feet to get himself out of trouble. The question comes down to what kind of fight Joshua wants. If he's content to win rounds by boxing and mixing it up only sporadically, that opportunity is there for him. However, if he wants to punish Parker and blast him out of the ring, then that scenario would give Parker more options in the fight. Joshua was dropped against Klitschko and staggered when facing Dillian Whyte. To this point in his career, Parker has displayed a good beard. His problems have come more from fatigue than from chin issues. In this fight Joshua has the flashier weapons – straight right hand, left hook and right uppercut; however, don't discount Parker's considerable power. Parker's at his best on the inside and he throws menacing shots downstairs. He may work the body as well as any current heavyweight. In addition, Parker throws a sneaky, short right to the head that often finds its mark because his foes are so conscious of protecting themselves from his body shots. Still, one can look at Parker's resume and not see a bona fide puncher as an opponent. Andy Ruiz is heavy-handed but lacks knockout weapons. Carlos Takam is a solid but not spectacular puncher. Although Parker's chin has held up until now, he's never faced a slugger like Joshua. Parker needs to defend himself on the inside against Joshua's uppercut and he also must be wary of Joshua's left hook from close range. On paper, Parker might have the edge in the chin department, but it might not play out that way on Saturday. 3. Who wins on the inside? Joshua has many weapons on the inside, but his shots aren't as short as Parker's; they need time and space to develop. Joshua, however, is the more accurate technician. He can cause damage with any of his shots without needing sustained flurries to land something meaningful. Parker often likes to grapple on the inside. He'll use his body to push opponents around to find angles to land his best shots. Much of this fight will come down to Ring IQ on the inside. Joshua doesn't have to engage at close range to win while Parker has to be on the inside to be victorious. Joshua should use his legs or tie up when appropriate. For Parker, he'll need some deception when attacking (something which hasn't exactly been his forte). Rushing in with crude punches won't be enough against a fighter with Joshua's weapons. Parker is also going to have to work in the clinch whenever possible. He shouldn't be initiating clinches to take a breather; that's an area in the ring where he needs to do his best work. Both Joshua and Parker have exhibited conditioning issues throughout their respective careers. Perhaps because of their size or that so many of their developmental bouts ended with early stoppages, neither boxer looks completely comfortable in the second halves of fights. Interestingly, they respond to fatigue differently. Joshua stops moving and becomes much easier to hit. When Parker is tired, he'll use his legs to move along the ropes, avoiding action. Joshua has demonstrated that he can catch a second wind in a number of his bouts while Parker seems to keep fading the longer that fights progress. The fresher boxer will have a huge advantage in the second half of Saturday's match. 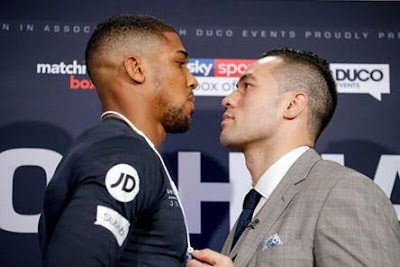 Both Joshua and Parker have announced that they plan to come in lighter than they have in their recent fights (the proof will be at Friday's weigh-in); they are essentially admitting that fatigue and conditioning have been problems in the past. It will be interesting to see which fighter has the conditioning edge over the duration of the fight. Often heavyweight bouts have several rounds that feature lulls in the action. The fighter who can push out a few more punches just might be the one to pick up needed rounds on the scorecards. With Rob McCracken in his corner, Joshua will have a significant advantage in this fight. McCracken has distinguished himself as a trainer, leading Carl Froch to glory in several big fights as well as shepherding Team Great Britain to great heights during the 2012 Olympics. Not only does McCracken have big-fight experience as a trainer, he has done very well in those matches. Featuring creative game plans and a no-nonsense attitude in the corner, McCracken also excels in the tough moments, helping to guide his charges out of danger and providing them with a path to victory (for example, Froch-Taylor, Froch-Groves I and Joshua-Klitschko). Parker's trainer, Kevin Barry, doesn't have the same type of strategic or motivational acumen that McCracken possesses. Parker underwhelmed against Fury and won a surprisingly competitive fight against Andy Ruiz. In addition, I'm not sure if Barry and Parker are always on the same wavelength. Parker can drift through rounds and Barry isn't always successful in goading Parker into fighting with more urgency. With a potential mega-fight coming up against Deontay Wilder, it's incumbent for Anthony Joshua to remain undefeated. In addition, Parker's specific skill set suggests that Joshua would be wise to fight a lot of the bout on the outside. Therefore, it wouldn't surprise me if Joshua-Parker turns out to be more of a tactical fight than many anticipate. If Parker's not on the inside, he can't win. No doubt McCracken delivered that message to Joshua during training camp. Ultimately, I think that the key word for Saturday's fight will be discipline. Expect to see Joshua utilize his considerable boxing skills to flummox and stymie Parker. Joshua's jab will be a significant factor in the fight and Parker won't find ways to get inside consistently. Joshua will fight within himself and won't look to force the action. If the opening isn't there, then Joshua will wisely pick up points with his superior boxing ability. I do expect there to be a few enjoyable tussles on the inside but as the fight progresses, we'll see a lot of the same thing: Joshua giving Parker a boxing lesson. By the end of the fight, Joshua will box his way to a comprehensive and dominant points victory. I'd be surprised if Parker wins more than two rounds. Anthony Joshua defeats Joseph Parker by unanimous decision.